Since it has been ages since I last stamped (**GASP** I really need to prioritize my life!) I decided to look through my files to find a photo I had not yet shared. I think I found something...This is a card I made for my dear friend Gillian and I don't think I never posted it because, at the time, I didn't want to ruin the surprise. :-) I also thought this would be a fun card to post as I'm using that same yummy Crate paper that I used in my last post! I adore this pattern!! 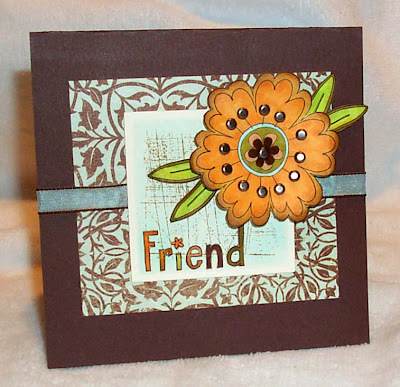 The "wreath" was created by using the outside edge of a chipboard flower, which I inked with some nice warm colors. The velvet flowers are from Papertreyink. The smaller ones were white and I was able to add some ink to change the color. The larger flower was already brown. The leaf is a Stampin' Up! image that I just colored, aged, and bent to look more realistic. The gorgeous wide ribbon is also from SU! It was quite an exciting weekend here in our household...The June issue of Cards arrived and my very first card ever published was inside!! I was even more excited to learn that they'd used my card as a two-page spread at the beginning of a chapter! Wow! Kind of weird to see your name in print and something you created in a magazine...Very fun indeed! Happy Creating and Happy Memorial Day! 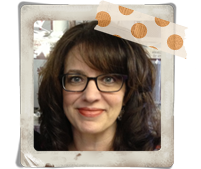 This week it was Kimberly's turn to set the challenge and she chose 'walking in love.' You can read her comments on the SALT blog. As I considered the challenge, my thoughts went to the greatest commandments, shown on my ATC above, which is to love God with all our heart, mind, and soul and to love our neighbor as ourselves. On our own, it would be impossible to complete such a task for we are all far too self-centered, thinking more about ourselves, our own ideas and feelings than those of others. We fail to obey God's simplest commands and are prone to react selfishly when called upon to express love for God and love for our neighbor. Love is more than a feeling, it is going above and beyond what you may inwardly "feel" and giving, in a sacrificial way, seeking to glorify God and not bringing glory to yourself. It's to strive to meet the needs of others more than the needs of yourself and to love God more than anything or anyone. It is only through Christ and the work of the Holy Spirit that we can even imagine being able to demonstrate this level of love. Through Christ we can have a hope that our selfish hearts will be changed into hearts full of love and compassion that are eager and willing to wait upon those in need and to love God as we ought. I thought of this ATC as sort of a bulletin, calling the reader to pay attention to the "important message" displayed next to the flower. The scripture verse referenced is from Matthew and was Jesus' response to a lawyer, who was testing him, and asked him which commandment was the greatest. The center of the flower was created from a circle stamp that reads "genuine article", a reference to the Bible. 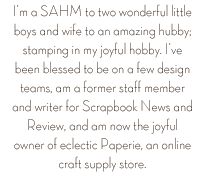 The word background is the definition of love, a stamp from Stampin' Up! Three silver brads hold my torn patterned paper onto the card base. Feeling inspired to create a "walking in love" project? Hop on over to the SALT blog to see all of the other beautiful creations made by our talented design team. Leave a comment and a link back to your blog or gallery. We'd love to share with you!! "Tiffany always wore her tiara to the office...all the other chicks thought she was the hippest." "Al always said the right things on their dates..."
This was quite a fun project as you felt a bit like a clothes designer trying to find the perfect outfit for a model. We were able to use any stamps we wanted..
On the first outfit I used a feathers from a peacock stamp to create the bottom of my model's (let's call her Tiffany) dress. The little pockets on the sleeves were created by using just one scallop from a scallop border stamp. The tiara and purse were images that can be used on all of justjohanna's chicklet stamps. You see one of the chicklet stamps at the bottom of the card. On my second card, where Tiffany is sporting her (as my brother would say) hottie boom-ba-lottie look for her date Al the Pirate, I used a cloud stamp as her shirt and a skirt from the Dancing Ladies kit. This was such a fun idea...why not give this kind of project a try with your own stamps...Leave a comment with a link back to your creation, I'd love to see what you come up with!! And here are some great shots of Manhatten! Promise to be back with some crafting posts this week!! I'll be away on vacation from 5/12-5/19 but I will have Internet access and will try to post a few things while I'm gone! Thanks for your patience!! Happy Creating! So vile I am, how dare I hope to stand, In the pure glory of that holy land? Before the whiteness of that throne appear? Yet there are hands stretched out to draw me near. Yet on mine ears the gracious tidings fall, Repent, confess, thou shalt be loosed from all. It is the voice of Jesus that I hear; His are the hands stretched out to draw me near. And His the blood that can for all atone, and set me faultless there before the throne. That in the Father's courts my glorious dress, May be the garment of thy righteousness. Yes, though wilt answer for me, rightous Lord. Thine all the merits, mine the great reward. Many people would state that they don't need forgiveness and yet, when we compare our every day acts against that of Christ, a sinless man, we are able to see our utter hopelessness of ever being worthy or "good" enough to receive the gift of everlasting life. Praise God, He sent a Savior who can forgive even the worse sinner and create in us a clean heart. "Mine the life won, and thine the life laid down...."
Please visit the SALT blog to enjoy the beautiful creations the team has made this week! You may click on each team member's name to visit their individual blogs and read more about their art pieces. If you are inspired by this week's challenge and would like to share something that you've made, please leave us a comment on the SALT blog with a link back to your blog or online gallery. We'd love to see your creations! I wanted a very elegant type of card but felt the heart on the plain cream was too plain so I embossed a second, smaller piece of cream cardstock and attached it with four silver brads. The hint of a pale blue ribbon also echoed the design of the album. The sentiment was a rub on, don't remember that vendor either, that I picked up at a neat little scrapbook store in a neighboring town.